ATLANTA, January 24, 2019	(Newswire.com) - ​​​​​​​​​​​​​The Top Advertising Agencies Report evaluates more than 2,300 advertising agencies based on Agency Spotter's proprietary research methodology. This report takes a broad look at advertising agencies from around the world. While many of the agencies may focus on marketing, the top advertising agencies in this report all have advertising as a core capability, and many also lead in-house marketing development. These top advertising agencies work with some of the world's most reputable companies including Amazon, Coca-Cola, Google, Guess, and HBO. Chemistry earned first place on the Top 30 Advertising Agencies Report. Chemistry is an independent, full-service marketing agency with offices in Pittsburgh and Atlanta and has earned the reputation as one of Atlanta's fastest growing companies of 2018. Robyn Bailey, VP Marketing/US Division of AmRest said this in his review of the agency, "Chemistry is one of my favorite agencies I have worked with in my career. They are bright, creative, nimble and simply a great partner." Chemistry​'s clients include Atlanta United FC, Marriott, Turner, and YouTube. 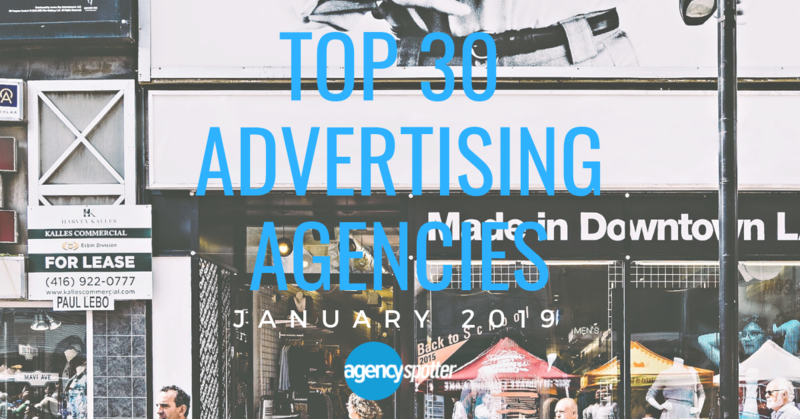 Traction placed second on Agency Spotter's Top 30 Advertising Agencies Report for January 2019. Based in San Francisco, CA, Traction's core services are focused on branding, advertising and web design. They also have in-house capabilities for strategy, creative, media, web development and analytics. ​With a successful method, driven by insights, this agency has been a 4-time finalist for iMedia Small Agency of the Year and has won Small Agency of the Year awards from both Advertising Age and the Business Marketing Association. Some of Traction's clients include Apple, Adobe, Bank of America, and SAP. 22 Driven Creative Supply Co.